NASHPORT, Ohio - A couple who held hands at breakfast every morning even after 70 years of marriage have died 15 hours apart. Helen Felumlee, of Nashport, died at 92 on April 12. Her husband, 91-year-old Kenneth Felumlee, died the next morning. The couple's eight children say the two had been inseparable since meeting as teenagers, once sharing the bottom of a bunk bed on a ferry rather than sleeping one night apart, the Zanesville Times Recorder reported. They remained deeply in love until the very end, even eating breakfast together while holding hands, said their daughter, Linda Cody. "We knew when one went, the other was going to go," she said. According to Cody, about 12 hours after Helen died, Kenneth looked at his children and said, "Mom's dead." He quickly began to fade and was surrounded by 24 of his closest family members and friends when he died the next morning. "He was ready," Cody said. "He just didn't want to leave her here by herself." The pair had known each other for several years when they eloped in Newport, Ky., across the Ohio River from Cincinnati, on Feb. 20, 1944. 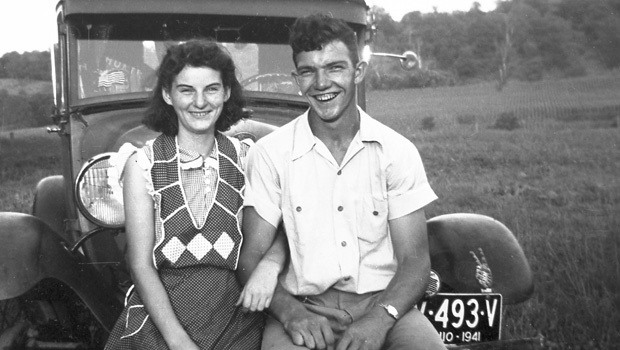 At two days shy of his 21st birthday, Kenneth was too young to marry in Ohio. "He couldn't wait," son Jim Felumlee said. Kenneth worked as a railroad car inspector and mechanic before becoming a mail carrier for the Nashport Post Office. He was active in his Nashport-Irville United Methodist Church as a Sunday school teacher. Helen stayed at home, not only cooking and cleaning for her own family but also for other families in need in the area. She taught Sunday school, too, but was known more for her greeting card ministry, sending cards for birthdays, sympathy and the holidays to everyone in her community, each with a personal note inside. "She kept Hallmark in business," daughter-in-law Debbie Felumlee joked. When Kenneth retired in 1983 and the children began to leave the house, the Felumlees began to explore their love of travel, visiting almost all 50 states by bus. "He didn't want to fly anywhere because you couldn't see anything as you were going," Jim Felumlee said. Although both experienced declining health in recent years, Cody said, each tried to stay strong for the other. "That's what kept them going," she said.